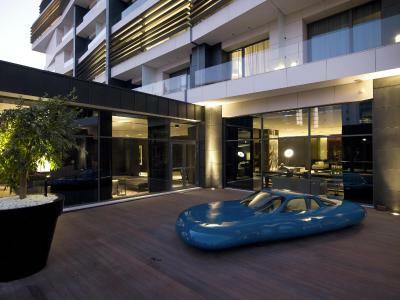 Lock in a great price for The Met Hotel – rated 8.6 by recent guests! 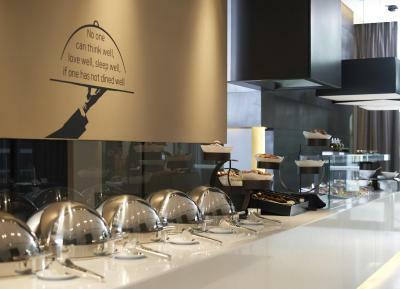 Great staff, amazing breakfast and truly 5* experience. I highly recommend it. The room was very comfortable and quiet. The breakfast selections were very good. We appreciated the complimentary glass of wine and the sweets in the room. The hotel is about one or two kilometers from the city center, quite walkable, tho the hotel has a regular shuttle if you don’t want to walk. Everything was perfect, the all hotel, the rooms, the rooftop, especially breakfast, they give you a free taxi to One Salonica and for the location is on a 10 min walk to the centar, i will highly recommend to everyone come here. Excellent accommodation, extremely friendly and helpful reception. 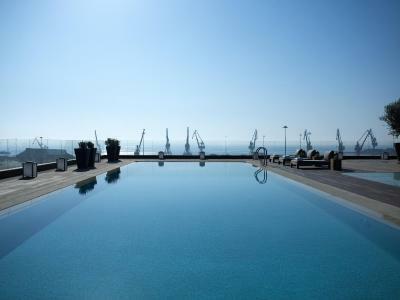 A pool and bar is located on the top floor, very enjoyable morning swimming. 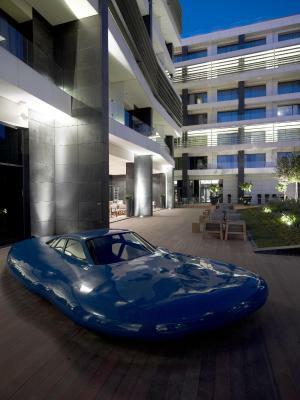 Hotel provides a car for commuting to the city center. 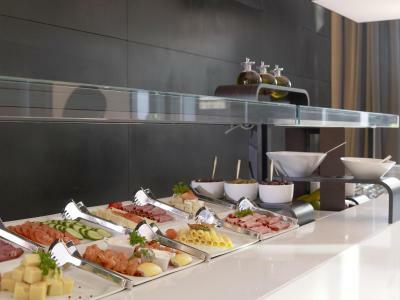 A great business oriented hotel with an award winning restaurant and -overall- very professional service. 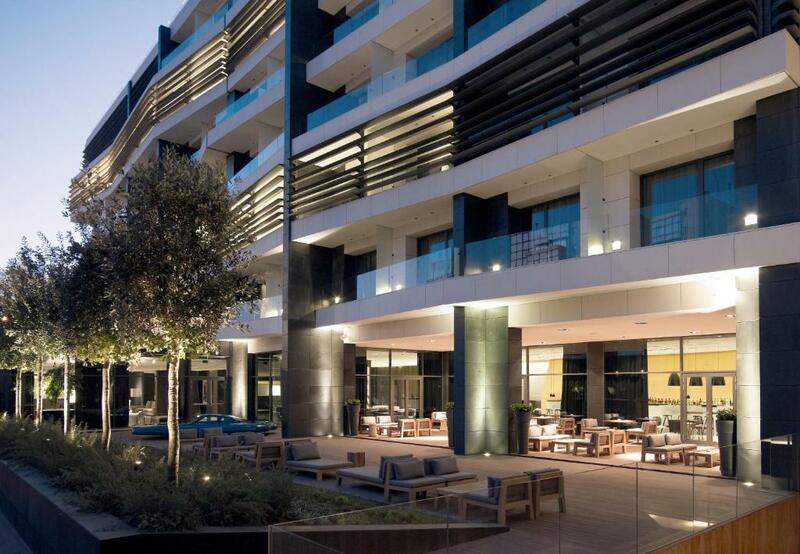 The Met Hotel This rating is a reflection of how the property compares to the industry standard when it comes to price, facilities and services available. It's based on a self-evaluation by the property. Use this rating to help choose your stay! 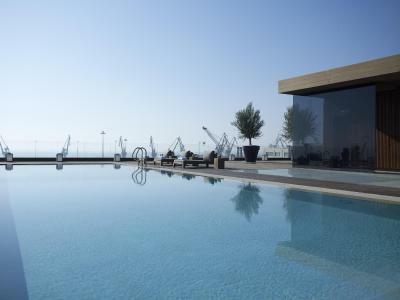 One of our top picks in Thessaloniki.Centrally located in the harbor, The Met Hotel features a spa and rooftop pool overlooking Thessaloniki City and Thermaikos Gulf. 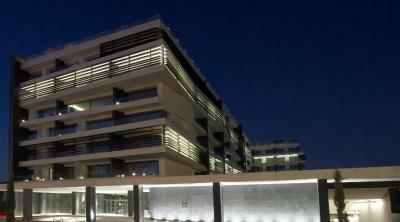 This design property is linked to Aristotelous Square by frequent shuttle bus at no extra charge. 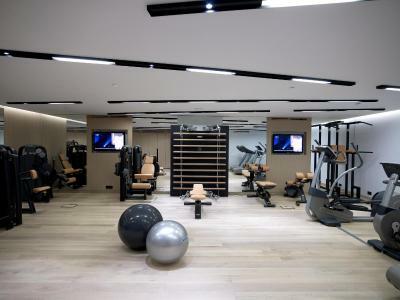 All air-conditioned accommodations has modern ambiance with wooden floors and marble bathrooms. Each soundproofed room offers free Wi-Fi. Satellite TV and work desk are included. Some rooms overlook the sea. Chan Restaurant offers an Asian menu and Avenue 48 restaurant serves Greek Breakfast buffet style, and Greek-inspired dishes. 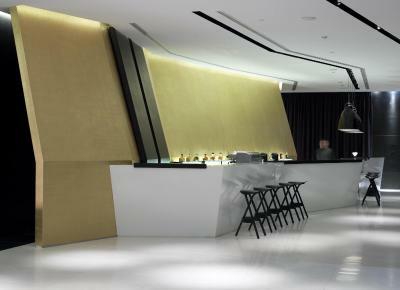 Guests can enjoy drinks at the Sky Bar with a 360°degree city view. Chan Bar serves late-night drinks while the Long Bar with the 22-carat gold-plated wall serves cocktails. 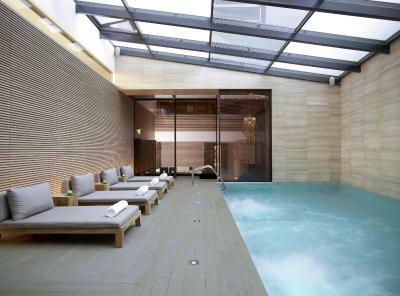 Wellness options at THE MET Hotel include a well-equipped fitness center, hammam, hot tub and indoor swimming pool. An on-site hair salon is available. 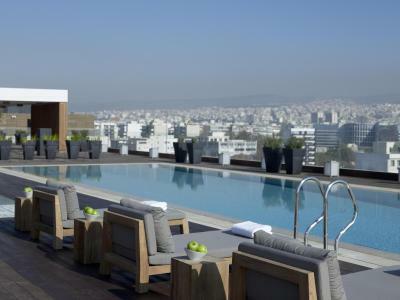 An ideal basis for sightseeing and shopping, THE MET Hotel is just 1.1 mi away from Aristotelous central square. Free shuttle service to the city center is available. Private underground parking is provided upon charge. 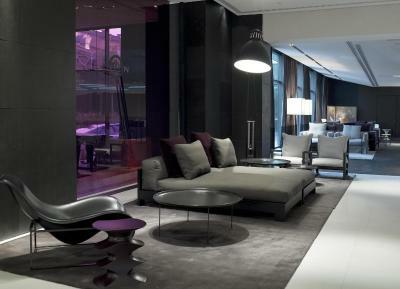 When would you like to stay at The Met Hotel? Featuring contemporary décor and elegant touches, Superior Plus Double Rooms propose to The Met Hotel guests, king size double beds with COCO-MAT eco mattresses, feather tops and fine linen. The room features high-speed internet access, 32’’ flat-screen TV featuring satellite channels. High-tech smart room keycard, laptop-size safe, individually controlled air-conditioning, direct dial telephone with voicemail capability and working desk are also provided. The elegant bathroom consists of a bathtub or a walk-in shower cabin, a second direct dial telephone, hairdryer, luxury cotton bathrobes & slippers, as well as beauty amenities. 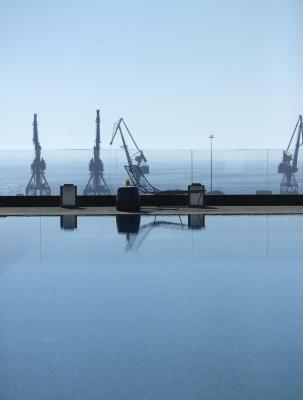 The wide windows and private balconies offer unique views to the city or to exquisitely designed corners of the hotel’s exterior. Featuring contemporary décor and elegant touches, Superior Port View Rooms propose to guests, either king size double or twin beds with COCO-MAT eco mattresses, feather tops and fine linen. Ηigh-speed internet access, 32’’ flat-screen TV featuring satellite channels are provided. High-tech smart room keycard, laptop-size safe, individually controlled air-conditioning, direct dial telephone with voicemail capability and working desk are also available. The elegant bathroom consists of a bathtub or a walk-in shower cabin, a second direct dial telephone, hairdryer, luxury cotton bathrobes & slippers, as well as luxury beauty amenities. 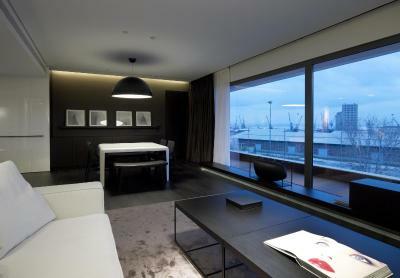 The wide windows and private balconies offer unique views to Thessaloniki new harbor. Deluxe Rooms offer divinely comfortable accommodations with a gallery quality design concept, consisting of twin beds with COCO-MAT eco mattresses, feather tops and fine linen. High-speed internet access, 32’’ flat-screen TV featuring satellite channels are available. High-tech smart room keycard, laptop-size safe, individually controlled air-conditioning, direct dial telephone with voicemail capability and working desk are provided. The thoughtfully designed bathroom offers a bathtub, separate walk-in shower cabin, separate WC, a second direct dial telephone, hairdryer, luxury cotton bathrobes & slippers, as well as luxury beauty amenities. The wide windows and private balconies feature direct city views. 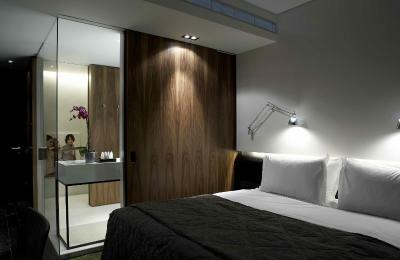 Located on the top floors, our Executive Rooms combine elegant contemporary design with absolute comfort. 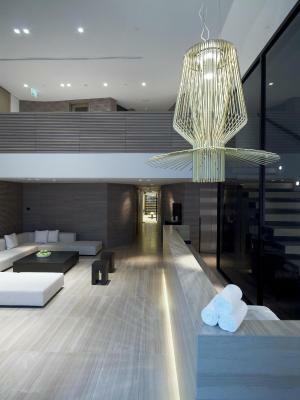 Large glass doors lead to a private balcony offering breathtaking city views. Featuring a double bed with eco-mattress, feather top and fine linen, high-speed internet access, 32’’ flat-screen HD TV with free satellite channels, high-tech keycard, laptop-size safe, individually controlled air-conditioning, work desk and direct dial telephone with voicemail. The stylish bathroom includes a bathtub, walk-in shower, separate WC, direct dial phone, hairdryer, luxury cotton bathrobes and slippers and branded personal care products. This room can accommodate an extra bed for a child between 6 and 12 years old at an extra charge of EUR 10 per night. 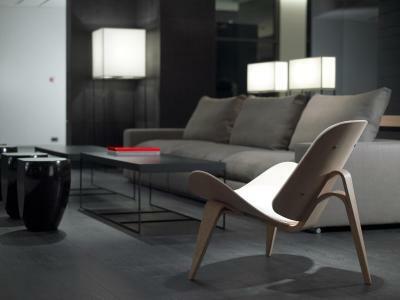 Combining stylish luxury and superior comfort with elegant contemporary design and using classy, high quality materials like walnut and black oak that lend an air of graceful sophistication. 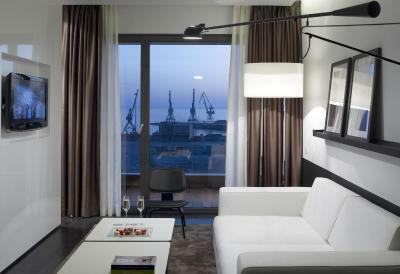 Generous living space that includes a lounge area with sofa and work desk, leading to a private balcony offering magnificent views of Thessaloniki’s new harbor. The spacious and stylish bathroom includes a bathtub, separate walk-in shower, oversize Corian basin, direct dial phone, hairdryer, luxury cotton bathrobes and slippers and branded personal care products. This room can accommodate an extra bed for a child between 6 and 12 years old at an extra charge of EUR 10 per night. 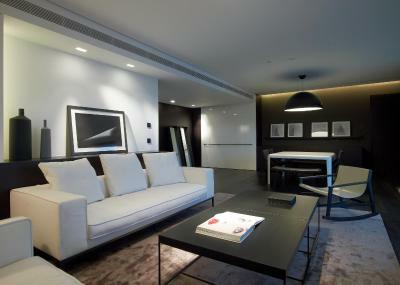 Located on the top floor of the hotel, this suite offers every opportunity to live in spacious comfort and style. The bedroom comes with a double king size bed with COCO-MAT eco mattresses, feather tops and fine linen to spread out, and relax in a separate elegantly designed living room. High-speed internet access, 42’’ flat-screen TV featuring satellite channels free of charge are provided. 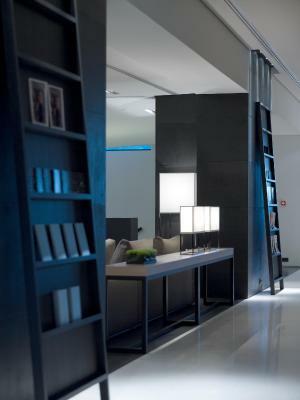 High-tech smart room keycard, laptop-size safe, NESPRESSO coffee machine and tea facilities, individually controlled air-conditioning, direct dial telephone with voicemail capability and working desk are also available. 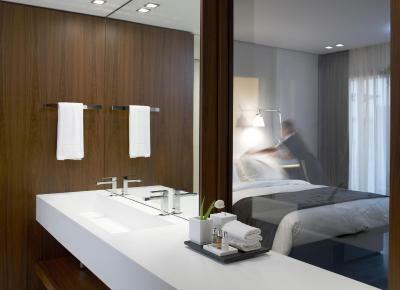 The elegant and spacious bathroom consists of a bathtub, separate walk-in shower cabin, large corian sink for double usage, a second direct dial telephone, hairdryer, luxury cotton bathrobes & slippers, as well as our luxury beauty amenities.The wall-to-wall windows and private balconies offer uninterrupted and mesmerizing views of the new harbor. Featuring contemporary décor and elegant touches, Superior Interconnecting double Rooms consist of 2 superior double rooms with an internal door. It features either king size double or twin beds with COCO-MAT eco mattresses, feather tops and fine linen. Ηigh-speed internet access, 32’’ flat-screen TV featuring satellite channels are also featured. High-tech smart room keycard, laptop-size safe, individually controlled air-conditioning, direct dial telephone with voicemail capability and working desk are provided. The elegant bathroom consists of a bathtub or a walk-in shower cabin, a second direct dial telephone, hairdryer, luxury cotton bathrobes & slippers, as well as luxury beauty amenities. The wide windows and private balconies offer unique view to the hotel's interior foyer. This room type cannot accommodate any extra beds. Featuring contemporary décor and elegant touches, Superior Plus Twin Rooms propose to The Met Hotel guests, twin beds with COCO-MAT eco mattresses, feather tops and fine linen. 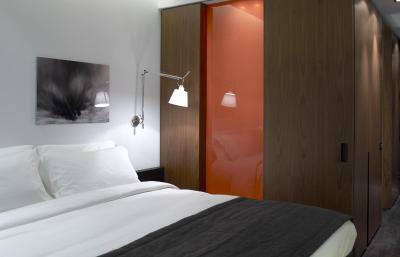 The room features high-speed internet access, 32’’ flat-screen TV featuring satellite channels. High-tech smart room keycard, laptop-size safe, individually controlled air-conditioning, direct dial telephone with voicemail capability and working desk are provided. The elegant bathroom consists of a bathtub or a walk-in shower cabin, a second direct dial telephone, hairdryer, luxury cotton bathrobes & slippers, as well as beauty amenities. 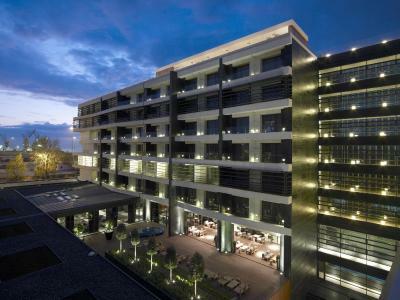 The wide windows and private balconies offer unique views to the city or to exquisitely designed corners of the hotel’s exterior. Featuring contemporary décor and elegant touches, Superior Rooms propose to The Met Hotel guests, king size double beds with COCO-MAT eco mattresses, feather tops and fine linen. The room features high-speed internet access, 32’’ flat-screen TV featuring satellite channels. High-tech smart room keycard, laptop-size safe, individually controlled air-conditioning, direct dial telephone with voicemail capability and working desk are also provided. The elegant bathroom consists of a walk-in shower cabin, a second direct dial telephone, hairdryer, luxury cotton bathrobes & slippers, as well as beauty amenities. 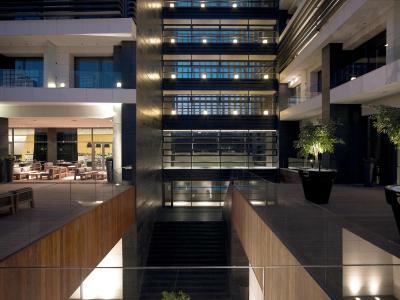 The wide windows and private balconies offer view to the hotel’s courtyard. 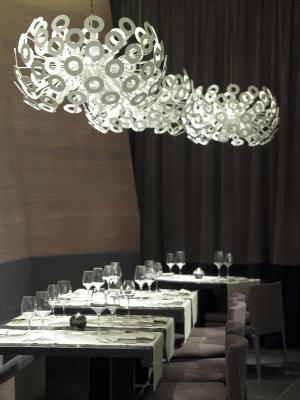 THE MET HOTEL provides exquisite service for business and leisure travelers. 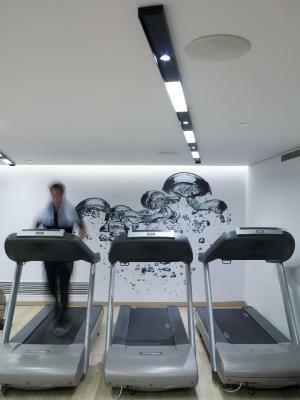 Unique pieces of art adorn all the hotel areas. Our goal is to embrace our customers by providing the highest level of services with attention to details. Recruitment of willing staff is our priority! House Rules The Met Hotel takes special requests – add in the next step! The Met Hotel accepts these cards and reserves the right to temporarily hold an amount prior to arrival. Please note that the outdoor pool will be open from beginning of May until October 3 (weather permitting), operating daily from 10:00 till 18:00. 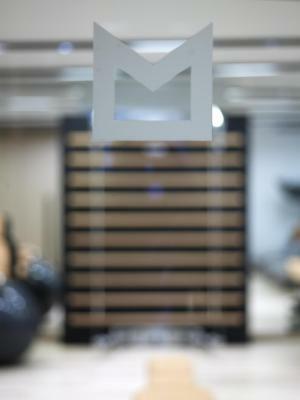 Please note that the M'SPA is open from Monday to Friday between 08:00-22:00, on Saturday between 09:00-21:00 and on Sunday between 10:00-20:00. 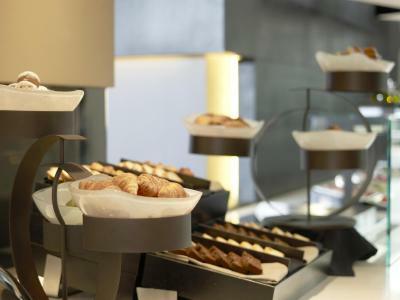 The Met Hotel participates in the Greek Breakfast Initiative by the Hellenic Chamber of Hotels. 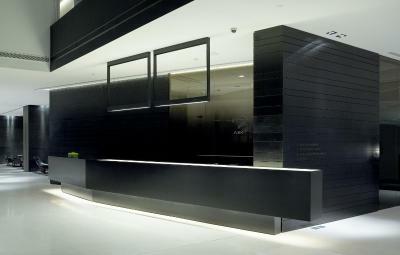 Due to safety reasons, guests are kindly requested to show upon check-in the credit card used for the reservation. Please note that smoking is not allowed in most of the rooms and the public areas of THE MET HOTEL. In case of smoking in a Non Smoking room a penalty of €150 will be applied. Service includes: Deep and allergic cleaning upon check out and pet amenities. Welcome drink during arrival, interesting hotel theme, quiet stay, many facilities, easy parking!!! Little noisy from a club next to the hotel. Felt like home. Again. The shuttle is great. Furniture is a little bit outdated. Vacuum cleaning starts at 9 AM, which is a little bit early. 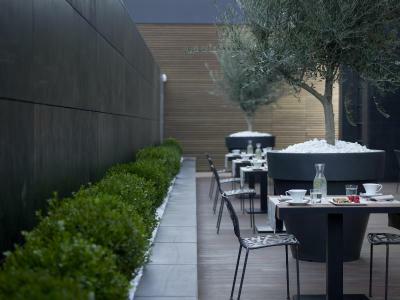 Hotel is in modern style with a lot of open air places for drinking a coffee and relax. Breakfast was good. Valuable thing is that the hotel has its own shuttle bus to the city center and you also get the mobile phone in the room with the Greek card. SPA center looks nice, but it is a little bit small and is missing the sauna. Massage is good. When I arrived it was really cold outside (<0 degrees) and the room wasn't warm enough because the heating was off until I got into the room. I had to wait >1 hour in order to feel comfortable enough to have a shower.. This happens to many hotels, but there are others that make sure to keep a card in the energy slot in order to have the heating system on (or the cooling system during summer) especially when they expect arrivals... So this is a comment for improvement. 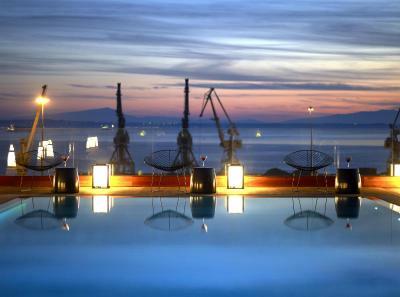 I visit Thessaloniki regularly for business or leisure purposes and I have stayed in all 5star hotels in the city. The Met is one of my favorites. The personnel is very helpful and responsive. 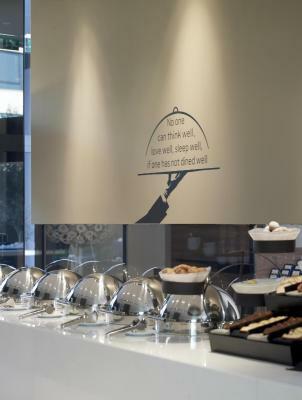 All facitilies exceed expectations and breakfast has everything you may wish for. 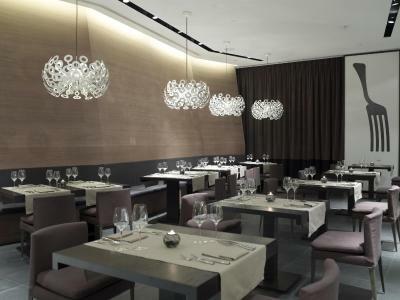 The service was excellent and the staff very friendly. The room was very nice and comfortable.